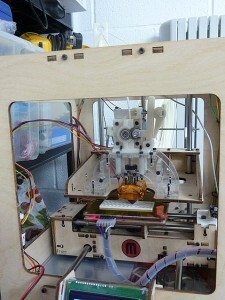 Home » U.S. Navy » 3D Printers Are Here Are the Sea Services Taking Advantage? 3D Printers Are Here Are the Sea Services Taking Advantage? In June, Wisconsin engineer Michael Guslick made headline news when used a 3D printer to fashion a working firearm modeled on the AR-15. Although it was later revealed that he had only printed the weapon’s receiver assembly, those in the Sea Services would do well to pay attention as the technology of 3D printing has the potential to affect a broad swath of the way the Navy and Marines do business. From naval architecture to logistics to the delivery of emergency medical care, the possible effects of 3D printing are far-ranging and profound. At its most basic, 3D printing—or additive manufacturing—is about starting with nothing and using base materials to build up to a finished product. Most models use nozzle jets to spray the base materials layer-by-layer, not unlike the way inkjet printers create color photos on a sheet of paper. That contrasts with the traditional technique of subtractive manufacturing—starting with large blocks of the base material and whittling them down through various processes to get to the end product. According to an article in The Economist, that traditional route typically cuts away and wastes up to 90 percent of the base material—a cost made all the more dear when using high-grade metals for military components, such as titanium for aircraft. In the same article, The Economist reported that researchers at European aircraft manufacturer EADS, demonstrating the use of titanium powder to print the same parts, used just 10 percent of the raw material. Smart defense companies already have begun to incorporate additive manufacturing into their production lines, and not only for the cost savings. If a printer is large enough the manufacturer can print components as a whole rather than requiring further assembly later. That allows designers to create both intricate internal structures to develop extremely strong parts, and more rounded shapes for system components such as ducting and piping, which increase system fluid-flow efficiency and eliminate unnecessary system volume. It also removes the need for brackets and flanges for handling and for surfaces to bolt or weld the pieces together. For those very reasons the Navy is already using “a number of printed parts such as air ducts” in F/A-18s. It is also for those reasons that the long-term trend will likely be toward larger 3D printers that can take on greater portions of the overall job. The shipyard of the future may well be an enormous printer. It won’t make sense to rely on 3D printing for every repair part or consumable. High-volume, heavy use items such as fluorescent light tubes or paper might still be cheaper off the production line. It also might not make sense to carry every rare raw material needed in parts with low rates of failure. Even then, if a failure does occur, printed stand-in parts might allow equipment to function at reduced capacity until a true replacement can be installed. And it’s not just standard parts that can be printed. Custom-fit replacements, shoring, and patching would be an easy adaptation. Ammunition and the drones that many anticipate playing a greater role in future warfare could also be produced shipboard if the right infrastructure is in place. Just last month the University of Southampton announced the successful printing of an entire working unmanned aerial vehicle—minus its engine. Even food (chocolate cupcakes) and living tissue have been successfully printed, raising the possibility of new ways of doing business in the galley and medical spaces. At the most radical end of potential innovation is that of resupplying the base materials. Hipple envisions a day when the warfighters in the field are able to harvest the stock they need to feed the printers directly from recycled waste or raw materials. Regardless of the source of the base material the military’s use of 3D printers might also disrupt the business model of purchasing finished components from contractors. Instead we may see licensing for a set number of printable copies or an outright purchase of the design. Either case greatly mitigates the fear of ending production lines. So what’s next? With most additive manufacturing breakthroughs and development occurring in the private sector many opportunities exist for experimentation and figuring out the unanswered questions. What base materials and what pre-printed parts make sense to embark? At what unit level would a printer be useful kit for the Marines? What challenges arise from printing at sea? What skills are needed to operate and repair the printers? Should the base materials be fed locally or integrated into a central distribution system? The sooner the Navy and Marines set about answering the questions the sooner they will most fully be able to take advantage of this promising new technology. To its credit, the Army is sending a 3D printer to southern Afghanistan to do exploring 3D printing technology as part of its Expeditionary Lab–Mobile. The Navy and Marines should similarly embrace experimentation, or at least seek to learn from the Army’s experiment.